Be a part of the crew aboard the U.S.S Enterprise and work together with family and friends to experience epic, deep space adventures! In Star Trek Panic, players take on the roles of various crew members from the classic Star Trek series like Kirk, Spock and Scotty. With their unique abilities they’ll work together to complete a series of missions while fending off a continuous onslaught of enemy ships and space anomalies. Your group of players makes up the main crew of the U.S.S. Enterprise. Each player chooses one of the seven crew members, each with it’s own unique ability. Players will take turns fixing the ship and/or its shields, maneuvering the ship itself, attacking oncoming enemy ships that move closer each turn, and playing cards towards the current mission objective. To win a complete game of Star Trek Panic your team must complete 5 missions and then clear the board of any left over enemies. Each mission has its mission parameters (unique rules and the number of turns your team must complete it in), mission objective (certain cards that must be played towards the mission, certain maneuvers you must perform and/or certain ships that you must destroy), and reward (drawing cards, repairing your ship, etc). The tricky part of the game is the constant onslaught of enemy ships that attack you each turn. Two new threat tokens are drawn after each turn which can be enemy ships, space anomalies (like comets), or events that happen immediately. It’s important to balance your actions between reaching your mission objective as well as taking care of the current threats on the board. The designers of Star Trek Panic really outdid themselves with the components that make up the 3D ship, its shields, and the damage it takes. Each piece does an amazing job of showing you the current condition of your ship. When your shield is damaged you place a damage token right on your shields. When your shield is down you remove it from the board. When your ship takes damage there are damage tokens that fit right on the spot where you’ve been hit, and if part of your hull is destroyed there are special tokens that fit over the different parts of the ship that can be destroyed. All of this leads to some epic visuals and really helps you get into the theme of the game. The cooperative play and awesome 3D ship is something the whole family will enjoy. The mechanics are simple enough you could easily include children as young as 8. This game is all about communication and cooperative play for up to six players. If your group is into sci-fi and Star Trek, you’ll also enjoy how each player takes on the role of the different crew on the U.S.S Enterprise, each with their own unique special ability. Strategy gamers will enjoy optimizing each turn to make it through every mission as effectively as possible. If you are the strategy guru in your group, this is definitely a game where you could lead your group through some epic adventures in space! Star Trek Panic is easy to learn and fun to play as a group. Fans of Star Trek, especially the 1960s series, will love playing this game. This is a game you’ll be able to pull out and play with almost any group. The variety of crew abilities and missions make each play-through unique and challenging. Power gamers looking for a lighter space game will enjoy Star Trek Panic, though they’ll get the most enjoyment out of the miniature game Star Trek: Attack Wing. If you’ve had the opportunity to play Castle Panic, the game that Star Trek Panic and others have been based off of, you’ll find Star Trek Panic to be very familiar yet very unique. The ability to maneuver the U.S.S. Enterprise through space offers an extra level of strategy and fun. If you enjoyed Castle Panic and you also like sci-fi and Star Trek, this game is a must have! If you enjoy games where your group plays as a team, Star Trek Panic is definitely a game to consider adding to your collection. Its theme resonates with a wide age range, its mechanics are fun and easy to learn and teach, and the components for the ship pull you into the world of space exploration and combat in the best ways possible. Play Star Trek™ Panic® and Defend the U.S.S. Enterprise! Space IS the final frontier . . . As part of the original crew of the U.S.S. Enterprise, your five-year mission is to explore strange new worlds, encounter alien civilizations, and defend the ship. Players work together to carry out missions while keeping the U.S.S. Enterprise safe from enemy attacks. Complete five missions with the U.S.S. Enterprise intact and win the game! 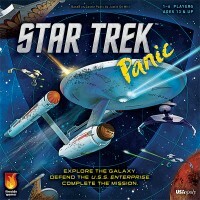 Star Trek™ PANIC® is a cooperative, light strategy tower defense game based on the popular Castle Panic® game. Perfect for families, friends, and cadets who want to explore the final frontier! Add a Review for "Star Trek Panic"